This entry was posted in Poems and other Randomocities and tagged Dandelions, DSLR, Flowers, Nature, Seasons, Sky, Spring, Time Lapse, Video, Yellow. Just in case you ever wondered. This entry was posted in Seriously? and tagged Baking, Chocolate, Chocolate Chips, Cookies, Cooking, Inception, Music, Noms, Sony, Time Lapse, Video. Once again, I am straying from my normal mode of posting randomness to bring you a tutorial-type post. In this post, I am going to lay out my method of using a webcam, a laptop, free software, and Sony Vegas 9 (or freeware programs) to make a time lapse video. First of all, I have a fairly good webcam, a Microsoft Studio, that is capable of shooting 1080p video and taking 8mp still shots, so the results of your time lapse will vary with the quality of camera. Various free programs exist that allow you to make time lapse videos, but most of them are either buggy or limited in function; I couldn’t use Tilaphos to shoot in HD, and Booru is pretty buggy. The solution to my problem lay in a very simple method of image capture. The laptop is not able to be used for other functions while it is capturing the image, but that was no big deal to me. My solution is to use a software auto-clicker to press the photo button at a certain interval. Download the auto-clicker here. (This is safe software that I’ve had no trouble with; no installation is required.) Unzip the .zip file and save the folder to a location that is easy for you to find. Open your webcam software and browse to a screen that shows a capture image button. 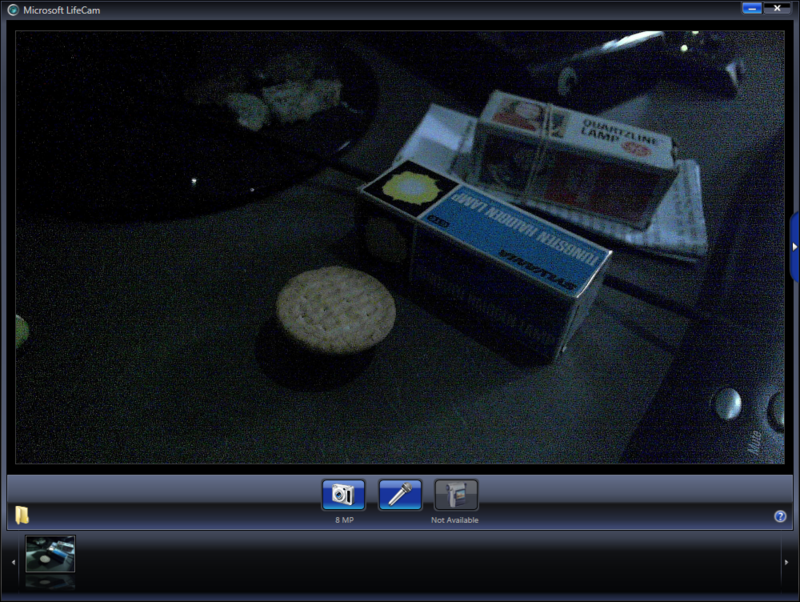 For those of us with Microsoft webcams, this is a little image of a camera. Once you have opened the software and have your webcam pointed at your subject, open the auto-clicker. 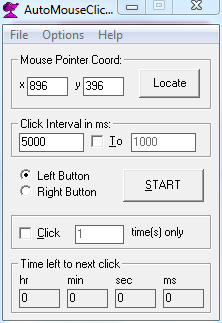 Set the point at which you want the mouse to click by clicking “Locate” and then clicking on the image capture button. Set the time interval (how often the software will capture an image) in the “Click Interval” section. The units are milliseconds, so if you want to take a picture every 5 seconds, set the first number to 5000. Ignore the second number, and leave the “To” box unchecked. Make sure that “Left Button” is selected, and set the number of clicks if you wish. (If you set the interval at 5000 ms, and you want to record for an hour, set the value to 720. Click the Start button and let take pictures for as long as you want. To turn your images into a time lapse in Sony Vegas, open the program, go to Options > Preferences > Editing, and set the “New image still length” to .050. When you insert the images into your timeline, the images will be the right length to play back at 30fps. Tweak your output settings to whatever you want; I set mine at 8mbps 1080 30fps in .wmv format. Alternate: If you do not have Sony Vegas, here is a tutorial detailing how to make a time lapse with various free programs. I recommend using Virtual Dub. Have fun! If you have any questions, feel free to leave them in the comments below. This entry was posted in How-To's, Photography and tagged Freeware, LeTourneau, Microsoft, Photography, Sony Vegas, Time Lapse, Videography, Videos, Webcam.